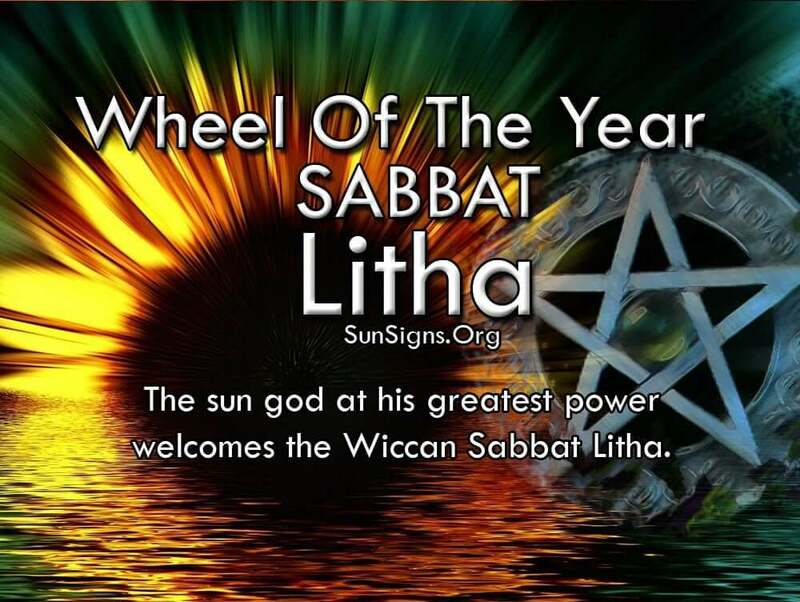 What Is the Wicca Sabbat Litha? Midsummer has come, the Summer Solstice, and on this day, the day is at it’s greatest length, the sun god at his greatest power welcomes the Wiccan Sabbat Litha. The sun god pours out his strength in the form of life-giving light upon the fields, and the crops are quickly becoming ready for their first harvest. In the trees and fields, some of these crops are already at the point where they are ready for their first harvest. This is the Wicca Sabbat festival of Litha. Where Beltane was the first taste of sexual passion, the deep rutting fire of adolescence, at this time of year sexuality is mature. This is the time when lovers have become comfortable with each other and know each other deeply. It is no longer the passion of the body, but of the heart, that binds God and Goddess together. During this time of year it is seen that the Goddess has become the deep mother, the housewife, lover and keeper of her children. The generosity of nature abounds in the fruits of the trees that give many more than the single seed that bore them. The honey flows heavily from the bees, and they continue to produce more than enough to survive the winters sparseness. The God has now reached his greatest strength and maturity, but it is also at this time that he begins to wane into the old wisdom of sagehood. In some Wiccan traditions there is a transition from the reign of the Oak King, to that of the Holly King at this time. The Lord of Summer giving way to the Lord of Winter. The altar at this time of year in the Wicca Sabbat Litha is best decorated with sunflowers to represent the god, and the deep mystery of the rose for the matured woman that is the Goddess. Many images of the sun can grace the altar, as well as the first wealth of the field brought forth in offering to they who made it possible. (Find out about sunflower symbolism). One of the traditions of this time is to build a Midsummer Fire, made of the woods of the Oak and Fir. These fires are used to drive away that which is baneful and would do us harm, and represent the good Sun god at it’s greatest strength. Like most Pagan holidays, Midsummer’s is celebrated with a great gathering, the building of fires, and servings of great feasts celebrating the seasons bounty. Handfastings were done at this time of year, binding together those who would love for a year and a day from the binding. Women would walk through the fields and orchards naked to bring bounty of fertility to the fields.